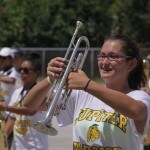 The Spirit of Jupiter Marching Band holds several band camps at the end of the school year and over the summer to teach students how to march, to learn the year’s competition show, and to come together socially as a group. 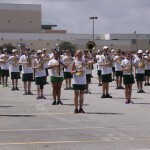 Plan to arrive BEFORE the scheduled start time at all rehearsals to allow enough time to take out any equipment needed so the band can START at the scheduled time. The general rule of thumb is to always be AT LEAST 15 minutes early. As always… to be early is to be on time, to be on time is to be late. Spring Camp dates are twice per week the last three weeks of the school year. Attendance is not mandatory, but we do encourage all students to attend as many rehearsals as possible. 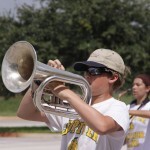 Springcamp dates are announced through middle school band directors and are available on the JHS Band Calendar. 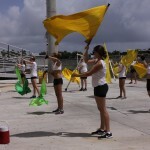 Students should wear comfortable clothing to Spring rehearsals. 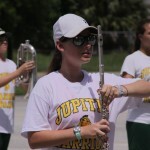 All students who join the Spirit of Jupiter Marching Band will receive an “official” practice uniform of two white t-shirts and one pair of green or black mesh athletic shorts, both with JHS Band logo. Additional rehearsal attire is the responsibility of the student. 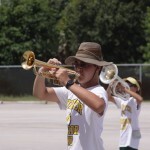 For more information about marching band uniforms and appropriate attire, please see our Uniforms page. White t-shirt – NO tank tops! Drink LOTS of extra water – especially the weekend before camp starts. Get outdoors and do some physical activity to get used the heat and get yourself into better cardio-vascular shape – don’t forget to wear sunscreen and a hat! Make sure you have all of the items listed above. Eat a healthy meal before each camp day. Include fruit. 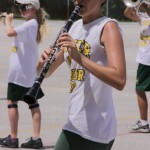 Don’t eat high sugar content foods, milk or other dairy products before camps or rehearsals. Your Camp/Rehearsal “uniform” green/black shorts, white t-shirt, sturdy sneakers, etc. 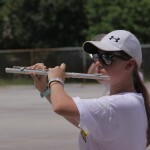 Be READY TO PLAY at the camp/rehearsal start time!